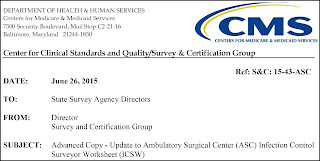 The Centers for Medicare & Medicaid Services (CMS) recently released an update to the Ambulatory Surgical Center (ASC) Infection Control Surveyor Worksheet (ICSW). ICSW is used by surveyors to determine infection control Conditions for Coverage compliance. Phenelle Segal, ASC infection control consultant and president of Infection Control Consulting Services (ICCS), has written a special report that examines these updates, identifying critical changes for ASCs to know about. Addition of subsection on immediate-use steam sterilization (IUSS). If you have questions about the revised ICSW and how it may affect your ASC, contact Phenelle by filling out the form here, emailing info@iccs-home.com or calling (215) 692-3485.